This page is full of information regarding Purchasing, Returns and Delivery. ‘In Stock’ Style & Salvaged products available for purchase online are subject to availability. As often products are handmade or upcycled and therefore ‘one offs’, or even when sourced, we only buy a limited number of pieces per style to maintain exclusivity, the styles may sell out very quickly, so our advice is, if you see something you love, buy it! It may not be available tomorrow. We have Style & Salvaged products that are ‘Pre order’. This means that they are produced to order. Once purchased online, we place the order with our supplier or Artisan, and will give you an expected date of delivery. If you choose not to proceed at this point, a full refund will be given. However, if you do want to proceed, and full payment has been made, we will then process the order, keeping you informed regarding delivery. It will then be shipped out to you as soon as it arrives. Very occasionally a purchase may be made and the particular item may have sold in the store, or at an Artisan Market at the same time. If for some reason we cannot fulfil your order, you will be informed by email and a full refund given. We reserve the right to limit the quantity of products we supply; supply only part of the order; or divide orders up. We also reserve the right to alter the terms of duration of special offers or sale promotions. Each client may make unlimited online purchases unless otherwise stated. Depending on availability, purchases may be made either directly through our website or over the phone. Whilst we aim to ensure all pricing is correct on our website, errors may occur. If we discover an error in the price of the items you have ordered, we will inform you and give you the option of reconfirming your order at the correct price, or cancelling it if you so wish. If we are unable to contact you, we will treat the order as cancelled. Title to any products on this website, and risk of loss or damage transfers to you on delivery of the products, providing we have received payment in full. The transaction will be charged to your card only after you card details have been verified and have received credit authorisation. If payment is made, but merchandise cannot be provided, a full refund will be given. For security reasons Style & Salvaged online may require a signature on delivery. In addition, items will not be sent to PO Box addresses. At present all purchases are shipped via Royal Mail or Private Courier. Orders are usually processed Monday to Friday (excluding bank holidays), and we try to ship purchases verified before 1200 pm on the same day, and those verified after this time the following working day. Style & Salvaged cannot be held responsible for unanticipated postal delays. If you wish to cancel or modify you order, please contact us as soon as possible. We will make every effort to accommodate your request, however once a product has left our premises for shipping, the transaction cannot be stopped. In this case, please refer to our returns policy. If you would like to purchase a different product please visit our website or contact us by telephone. 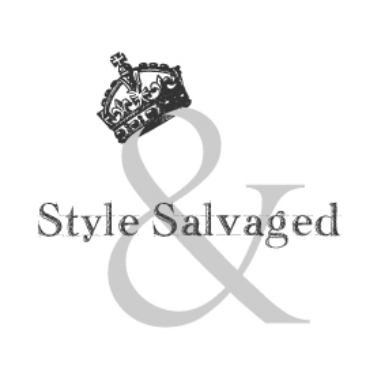 Style & Salvaged wants to ensure your complete satisfaction. For online purchases, we will accept for refunds (excluding postage costs) merchandise not used or damaged, with all original tags still attached, when accompanied by the original sales receipt. Refunds may only be issued in the same form as payment was made. Merchandise must be returned within 14 days of the date of delivery. Shipping costs are non-refundable. Please note that a different return policy applies for in-store purchases at Style & Salvaged. Upon receipt of returned merchandise, every effort will be made to ensure a prompt refund, and an email will be sent to you to advise you when the refund is complete. At Style & Salvaged we guarantee that, to the best of our knowledge, our sourced products are from companies that are Fair Trade, or operate in an ethical manner, and are produced to a very high standard. Our handmade and upcycled products are created ethically, with lots of love. If you wish to purchase a Style & Salvaged gift certificate, you can order them for any amount, or specific workshop, online to be sent, nicely packaged, to yourself, or the recipients address. A Gift code will be on the Gift Card. At present, Gift certificates can only be redeemed in store.